Visit the Cal Academy with the kids for DIno Days during Spreak Break. What are you doing on your time off from school in April? Here are a few of our picks for fun things to do with the family around Marin County, the Bay Area, and Northern California during Spring Break. Enjoy! Walk with the dinosaurs at the California Academy of Sciences' Dino Days. 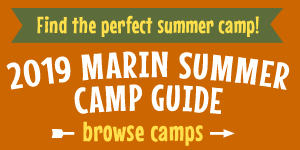 Look for wildflowers and wildlife on a spring family hike in Marin. Check out the cherry blossoms at the Japanese Tea Garden in Golden Gate Park. Visit the animals and ride the to gondola the California Trail at the Oakland Zoo. Take the kiddos a fun and exciting train ride in Northern California, from kid-sized mini trains to the real steam-powered deal. Take the kiddos on a last-minute California family road trip. Get the whole family rolling on an easy mountain bike ride in Marin. Explore Sonoma Valley for family-friendly wineries, hikes, historic sites, and more. Get up-close-and-personal with baby animals on a local farm tour. Learn and have fun at a hands-on museum in the Bay Area. Also, check out our calendar for library storytimes and other great family events. If you're looking to take advantage of March's snowfall in the mountains during Spring Break, make sure you check out our ultimate guide to family ski and snow play fun in Lake Tahoe.